Margin debt is up 100 times in the last 39 years. A famous quote attributed to Archimedes, the ancient Greek mathematician, is: "Give me a place to stand and with a lever I will move the whole world." And, as you probably know, leverage can also move the stock market. In the July-August Elliott Wave Theorist, Robert Prechter discussed the role of leverage in sending the market to new price highs. Get a FREE 2-page sample of Robert Prechter's Elliott Wave Theorist. First, take a look at this chart from that issue, and then read Prechter's commentary. 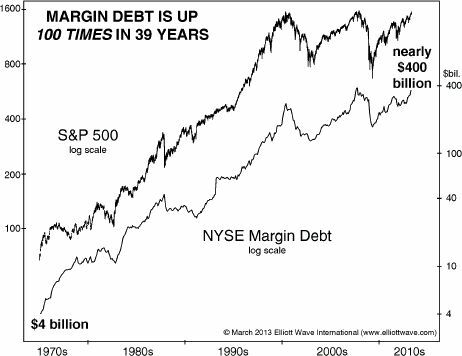 Margin debt, incredibly, is up 100 times in the last 39 years (see the chart above). It was $4 billion back in 1974; it's nearly $400 billion today. That is a big reason why stock prices are in the stratosphere. You might think that there's a lot more money around, thereby justifying the rise. ... Let's normalize this indicator to GDP and see what we have. ... [Margin debt as a percentage of annual GDP is still 10 times the 1974 level. ... The current ratio is also 3 times what it was at previous major tops in the stock market in the 20th century. Margin debt levels are not a precise market timing indicator, but one major financial firm advises caution. "Investors have rarely been more levered than today," said Deutsche Bank, warning that the spike in margin debt is a "red flag" and should be watched closely. ... It said the equity rally may have further legs but it cited "astonishing similarities" between the latest patterns and events preceding prior market crises. The high levels of margin debt in the stock market should be a concern to every investor, as should other indicators that Elliott Wave International reviews. You can learn what EWI sees ahead for the market by reviewing The Elliott Wave Theorist without any obligation. No questions will be asked if you decide to cancel within 30 days. You have nothing to lose and exclusive market insights to gain. See what Prechter presents to subscribers of The Elliott Wave Theorist with no obligation for 30 days. The September issue is packed with insights you won't see anywhere else. Preview what's inside and learn how to get your risk-free review. This article was syndicated by Elliott Wave International and was originally published under the headline A Big Reason Why 2013 Stock Prices are in the Stratosphere. EWI is the world's largest market forecasting firm. Its staff of full-time analysts led by Chartered Market Technician Robert Prechter provides 24-hour-a-day market analysis to institutional and private investors around the world.